Europapark has erected the biggest and tallest steel roller coaster in Europe. The tracks have a height of 73 meters and it reaches a maximum speed in the neighbourhood of 130 km/hour. 36 passengers (9 x 4) can ride in each of the cars. The bolides propels them above the 70 meter mark before rushing them to the ground at a 70° angle...an experience that feels like free fall. In order to makes this project a reality, two heavy weights got together: Europa-Park was in charge of the construction of this remarkable coaster christened "Silver Star", and Mercedes-Benz was responsible for creating the mythic atmosphere based on a sports car theme. Space, speed, and purity of feeling...Silver Star's ambition is to open a new dimension of freedom. 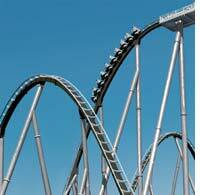 This silver coloured roller coaster will be in operation at the opening of the 2002 season. Made by the Swiss constructors "Bolliger & Mabillard" in tight collaboration with the company "Mack" of Waldkirch, it will be the 4th ranking coaster in the world, and the 1st in Europe. We have tested it for you.